Printer Technology has advanced greatly over the past few decades. Yesterday's impact printers were noisy devices that either churned out blocky documents mixing text and graphics or generated attractive text, but without the ability to print graphics, varying fonts or even varied text sizes. Many of today's non-impact printers are almost whisper quiet and generate entire pages in just a few seconds. However, impact printer technology still has its benefits. Impact printers operate by having an element strike the paper. An impact printer forms characters and graphics on a piece of paper by striking a mechanism against an inked ribbon that physically contacts the paper. Impact printers are ideal for printing multipart forms because they easily print through many layers of paper. Two commonly used types of impact printers are dot-matrix printers and line printers. A dot-matrix printer produces printed images when tiny wire pins on a print head mechanism strike an inked ribbon. When the ribbon presses against the paper, it creates dots that form characters and graphics. Dot-matrix printers typically use continuousform paper, in which thousands of sheets of paper are connected together end to end. The pages have holes along the sides to help feed the paper through the printer. The speed of most dot-matrix printers ranges from 375 to 1100 characters per second (cps), depending on the desired print quality. A line printer is a high-speed impact printer that prints an entire line at a time. The speed of a line printer is measured by the number of lines per minute (lpm) it can print. Some line printers print as many as 3,000 lpm. For instance, to make a capital "I" in a serif font, the top and bottom pin would fire, then every pin would fire, then the top and bottom pin would fire. The pins strike an ink-impregnated ribbon and press it into the paper, leaving a mark. One of the problems with dot matrix printing technology is that there are gaps between the pins, leading to output that has a number of gaps and looks incomplete. Daisy wheel impact printers pressed a wheel with pre-formed characters, much like the mechanism in an electrical typewriter, against a ribbon to form an impression on a page. They produced very high quality output but could only print in a single font and character size. In addition, they were extremely slow, with some printing just 10 characters per second. The printheads of non-impact printers do not strike the page. In an inkjet printer, a printhead sits a small distance above the page and either sprays ink or pops a bubble of ink onto the paper. Laser and light-emitting diode printers use electrical charges to transfer dry toner particles from a light sensitive drum to a piece of paper and then melt the toner onto it. Impact printers have a couple of benefits. The first is that since they use pressure to generate an image, they work with multipart forms that either have leaves of carbon paper or use carbon-imprinted paper. The second is that since they print one line at a time instead of one page at a time, their paper feed mechanisms are designed to let them use continuous forms. A nonimpact printer forms characters and graphics on a piece of paper without actually striking the paper. Some nonimpact printers spray ink, while others use heat or pressure to create images. 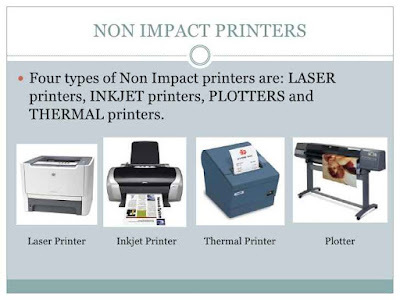 Commonly used nonimpact printers are ink-jet printers, photo printers, laser printers, thermal printers, mobile printers, plotters, and large-format printers. An ink-jet printer is a type of nonimpact printer that forms characters and graphics by spraying tiny drops of liquid ink onto a piece of paper. Ink-jet printers have become a popular type of color printer for use in the home. Ink-jet printers produce text and graphics in both black-and-white and color on a variety of paper types. A photo printer is a color printer that produces photo-lab-quality pictures. Some photo printers print just one or two sizes of photos, for example, 3 3 5 inches and 4 3 6 inches. Others print up to letter size, legal size, or even larger. Many photo printers use ink-jet technology. With models that can print lettersized documents, users connect the photo printer to their computer and use it for all their printing needs. 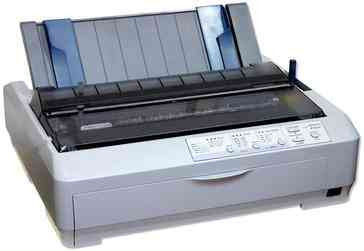 A laser printer is a high-speed, high-quality nonimpact printer.Laser printers for personal computers ordinarily use individual sheets of paper stored in one or more removable trays that slide in the printer case. Non-impact printers have advanced to a point that they are better than impact printers at just about everything other than feeding continuous paper and working with multi-part forms. They have much higher resolutions since, instead of using metal pins, they can use drops of ink measured in picoliters or toner particles measured in micrometers. Non-impact printers are also much quieter, making it possible for them to be used out in the open in office settings. ||ੴ||ਇੱਕ ਓਅੰਕਾਰ Satnam Shri Waheguru Ji A Web Blog about Product Review, Blogging Tips, Tech Reviews: What is the Difference Between Impact Printers and Non-Impact Printers?